By this stage, your little one will be gaining weight more quickly than ever before and probably tips the scales at around 2kg. They may have exceeded 48cm in length and the growth spurt is set to continue through your final weeks of pregnancy. Now that your baby has become so large, your body has ceased to produce as much amniotic fluid, simply because there isn't the space for it. This may cause some additional discomfort as there is less fluid serving to protect you from the force of the kicks and punches. By now you may have begun to experience Braxton Hicks contractions. You will feel a tightening of the uterus wall and if you feel your tummy with your hands while these occur you will notice that the tummy feels a lot harder during the contraction; it may even change in shape if you watch carefully. Firstly, Braxton Hicks are nothing to worry about, so don't go rushing into hospital just yet. They are generally thought to be your body's way of keeping the muscles of your uterus toned and to prepare them for labour. You have probably been having these 'practice' contractions for some time, but they tend to strengthen through your pregnancy so different women notice them at different stages. They should not be painful but they can be uncomfortable. You can help to ease the discomfort by changing your position, or by taking a little walk around. It is also important that you stay hydrated, as dehydration can cause or increase contractions. Braxton Hicks are usually irregular and last around 30 seconds, although they are up to 2 minutes for some women. If you are concerned that they are getting regular, or if you are worried that you may be confusing Braxton Hicks with real labour then make a note of the frequency and duration of each contraction and call your midwife for advice. The baby has most likely settled into a position now from which they may not move, or at least not move from very often. Ideally, the baby will be head down with its head in your pelvis. You may be able to tell from the kicks you are getting to your rib cage that this is the case, but your midwife will be able to tell you at your next appointment. When a baby is positioned head-up, with either the feet or bottom lined up to be delivered first, they are said to be in a 'breech position'. 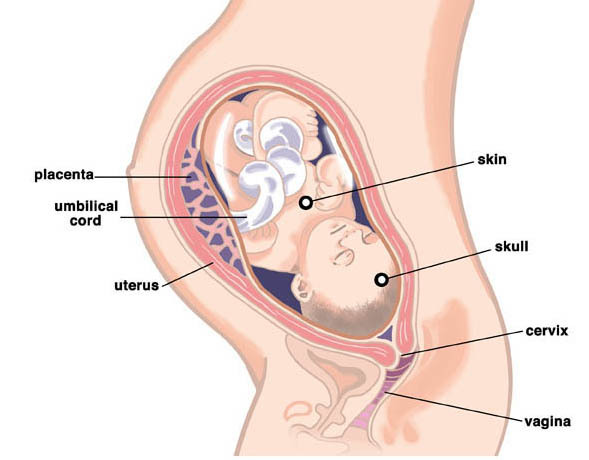 It is possible to deliver a breech baby naturally but a vertex (head down) position will make delivery easier. If the baby has not yet settled into a head-down position then there are various exercises that you can do to help encourage them to turn. Ask your midwife before attempting any of these exercises, but she or he is likely to recommend either rocking backwards and forwards on all fours, or kneeling down with your head and shoulders flat on the floor (the bed may be more comfortable) with your bottom in the air. Such approaches have been shown to be very effective in turning a baby when practiced many times a day for a period of several days. Page generated in 1.3082 seconds.